The upcoming Marvel Cinematic Universe Phase 2 Box Set is filled with all kinds of goodies for comic book movie fans. There’s a Tony Stark tattoo from Iron Man 3, a file on Bucky Barnes from Captain America: The Winter Soldier, and the whole thing is even shaped like the orb from Guardians of the Galaxy. Of all the cool little props inside, however, there is one piece that is the most intriguing: The Sokovia Accords. 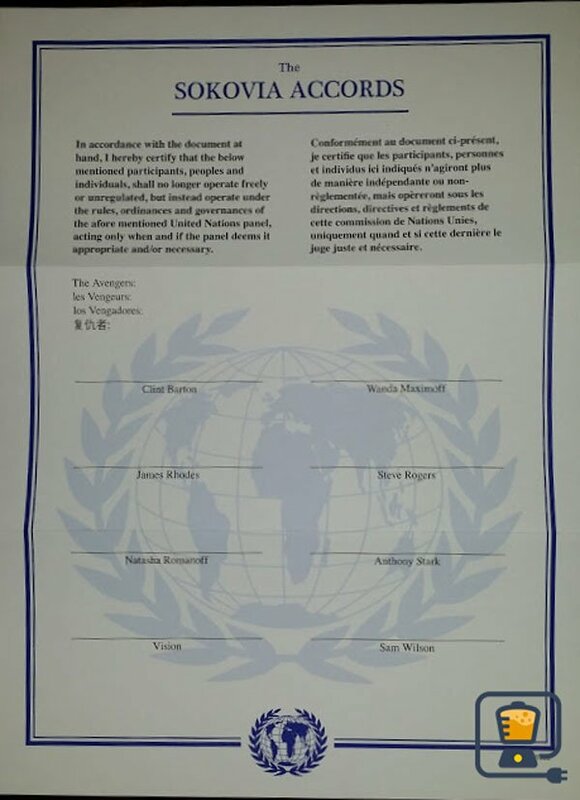 In accordance with the document at hand, I hereby certify that the below mentioned participants, peoples, and individuals, shall no longer operate freely or unregulated, but instead operate under the rules, ordinances and governances of the afore mentioned United Nations panel, acting only when and if the panel deems it appropriate and/or necessary. In laymen’s terms, The Avengers will no longer be officially sanctioned to try and stop global terror without the consent of a panel made up of various individuals from the United Nations. Clearly feeling guilty about the events that occurred in Sokovia (a.k.a. the final act of The Avengers: Age of Ultron), this is a deal that Tony Stark/Iron Man agrees to sign – but it doesn’t quite get the same support from Steve Rogers/Captain America. After seeing HYDRA infiltrate and totally dismantle S.H.I.E.L.D., he’s not the biggest fan of working under the control of government bodies anymore – and this leads to serious superhero vs. superhero conflict. As you can see, the paper leaves spaces for all of the various Avengers to sign – including Clint Barton/Hawkeye, Wanda Maximoff/Scarlet Witch, James Rhodes/War Machine, Steve Rogers/Captain America, Natasha Romanoff/Black Widow, Anthony Stark/Iron Man, Vision, and Sam Wilson/Falcon – but you’ll notice that there are a couple of key names missing. While it’s possible that this prop doesn’t fully represent the signing page of the Sokovia Accords in the Marvel Cinematic Universe, it is strange that neither Thor nor Bruce Banner/Hulk are mentioned. While you might argue that it’s because they left the Avengers at the end of Age of Ultron, that doesn’t really explain why Hawkeye and Iron Man are mentioned. Perhaps they get a pass for respectively being an alien and entirely uncontrollable? We will get to see all of the drama surrounding the Sokovia Accords play out in just a few months, as Captain America: Civil War will be in theaters on May 6, 2016. The film is being directed by Joe and Anthony Russo based on a script by Christopher Markus and Stephen McFeely – the same four men that brought us Captain America: The Winter Soldier. We can only keep our fingers crossed that the new movie will deliver on the same level.